A subspecies of the Timber Rattlesnake, this close cousin occurs in lowland areas such as swamps, cane brakes, and riverine thickets rather than the higher elevations of the Timber. 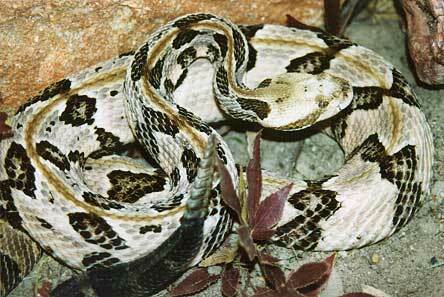 Many taxonomists believe it to be a geographical variation of the Timber Rattlesnake. It intergrades with its northern cousin in many areas. The rust-colored dorsal stripe is a good identifying mark on the Canebrake and may be the only noticeable difference between it and the Timber. Average 3 to 4 feet long. Range: Southern Virginia, south to the panhandle of Florida and west of central Texas.